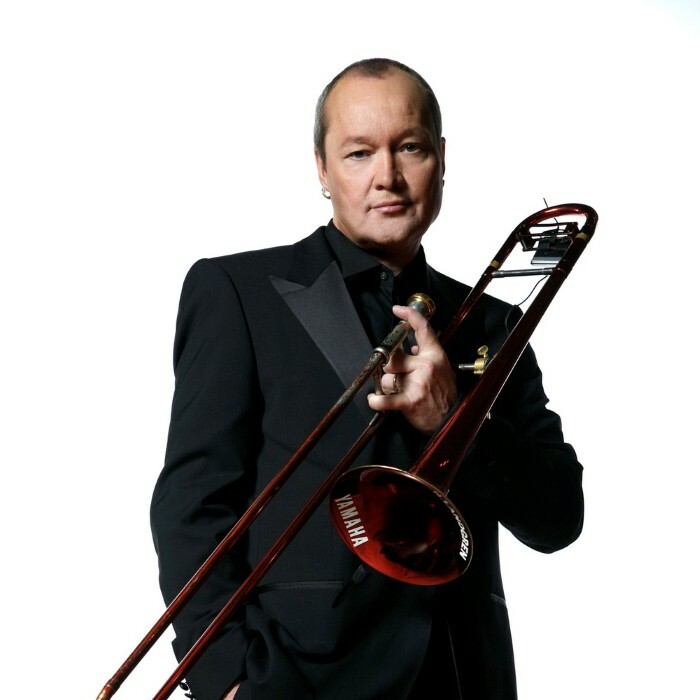 Nils Landgren (born 2 February 1956 in Degerfors, Sweden) is a Swedish R&B funk and jazz trombone player. Between 1972 and 1978 he studied classical trombone at the music college in Karlstad, Sweden and continued his education in the university in Arvika. Upon meeting the Swedish Folk-Jazz pioneer Bengt-Arne Wallin as well as trombonist Eje Thelin, Landgren was persuaded to move from his strict classical studies to improvisation and to begin the development of his own sound and approach to music. After his graduation, Nils moved to Stockholm to work as a professional trombone player. He was soon touring with the successful Swedish pop star, Björn Skifs. Björn Skifs' band, Blue Swede, recorded a number one hit song in the U.S. pop charts with "Hooked on a Feeling". Thad Jones in 1981 invited Landgren to join his new big band project, called Ball of Fire, as the lead-trombonist. Since adulthood, Landgren has covered a wide number of genres involved in most styles equally: jazz and rock, soul and hip hop, big band sessions, and solo work. By his own reckoning, Landgren at least 500 albums including such internationals stars as ABBA, The Crusaders, Eddie Harris, Bernard "Pretty" Purdie, Wyclef Jean and Herbie Hancock. In 1983 Landgren recorded and released his debut album as a solo artist. Planet Rock, followed by Streetfighter in 1984, You Are My Number One in 1985, Miles from Duke with Bengt-Arne Wallin in 1987, Chapter Two 1 in 1987, Chapter Two 2 and Follow Your Heart in 1989. Between 1985 and 1987 Nils also performed as actor, singer, trombonist, and dancer in over 360 performances of the Swedish "play of the year", SKÅL, as well as appearing in several TV-films as an actor. In 1992 the first performances and recording of the Nils Landgren Unit took place. His breakthrough beyond Scandinavia occurred in 1994: It was at the Jazz Baltica Festival at Salzau in Germany, that the "Unit" became the Nils Landgren Funk Unit. The album "Live in Stockholm" (ACT 9223-2) was released that year and was the foundation for the collaboration with Siegfried Loch and his then nascent ACT label.